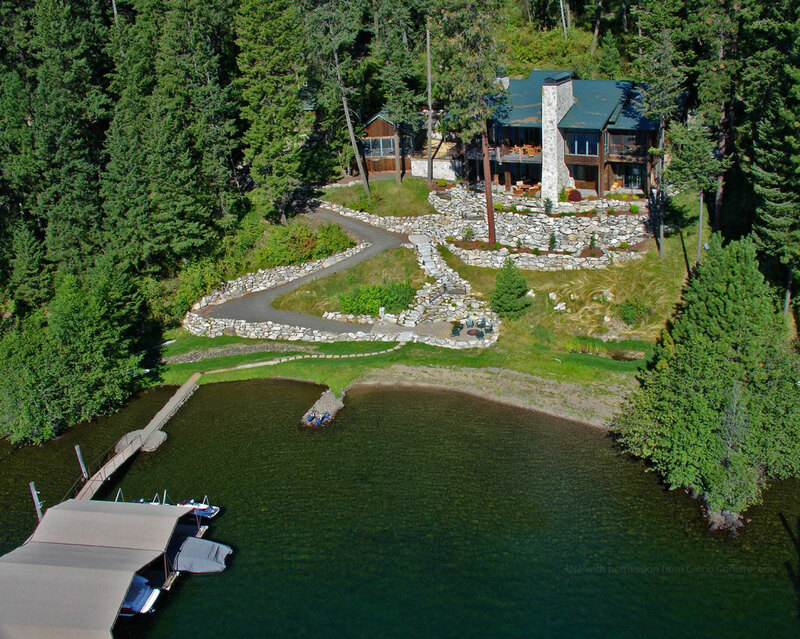 Nestled next to the family’s 100-year-old cabin, this rustic 4400 sf, 4 bed, 5.5 bath lake cabin presented unique challenges in the site’s steep slope into Lake Coeur d’Alene. Extra foundation supports, a supporting 14′ wide rock-walled chimney and creative retaining walls allow the cabin to stand above the water, offering superior lake views. While the home was being built, Matt Fisher also oversaw the restoration of the old cabin sitting adjacent to the new home. 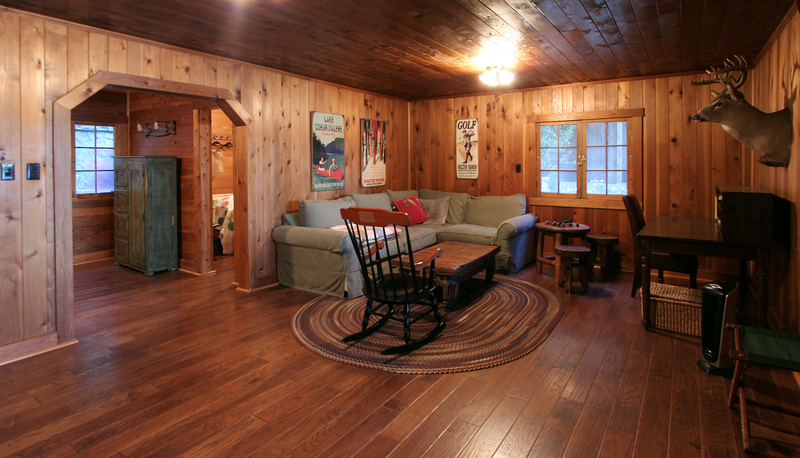 This now-restored cabin provides the family with a charming guest house. Scroll and click to view images in larger format. Night offers a stunning view of this custom-built lake cabin and it’s glassed walls overlook Lake Coeur d’Alene with the restored 100-year-old guest cabin settled next door. Custom Home built by Matt Fisher. This cozy kitchen and great room are packed with details from the over-size range hood on the timbered wall and custom kitchen cabinetry to the multiple lighting options and rustic floors, giving this new home a rustic, well-lived feeling. 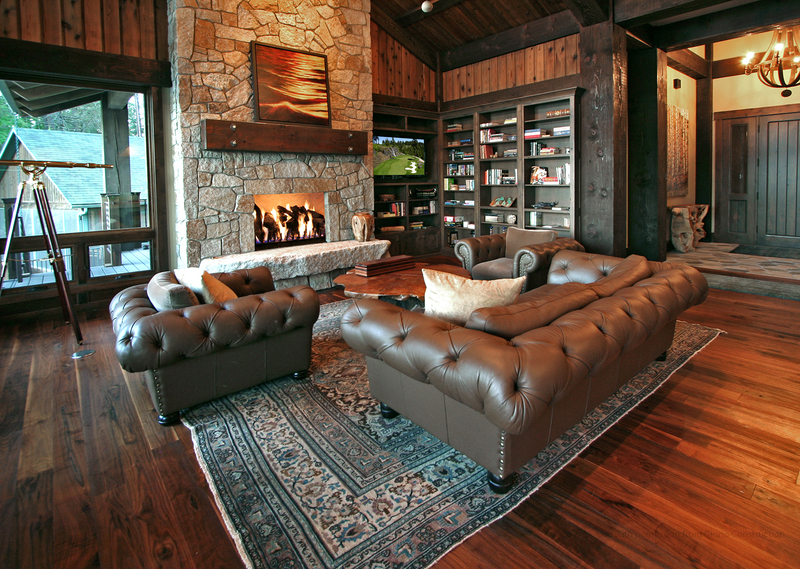 The great room adjacent to the kitchen shows the 2nd rock-walled fireplace in the home as well as built-in shelving and entertainment center. The restored cabin, now guest house, sits next door. The simple but elegant dining room frames the biggest design element in windows surrounding the table on two sides. When the weather is too cold to sit outside, the lake comes inside. 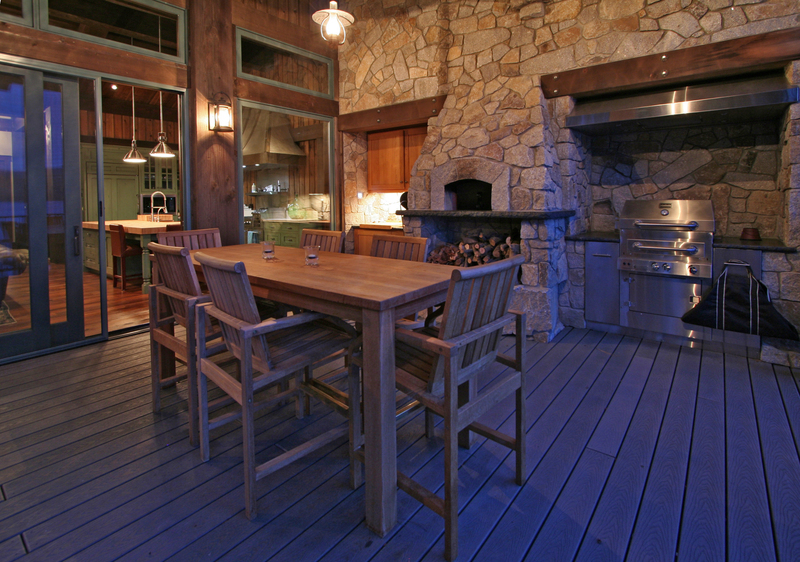 These indoor and outdoor kitchens run seamlessly together through large glass doors and walls. The Italian wood-fired pizza oven is integrated into the 14′-wide stone-worked chimney that stands as a deep-rooted support as well as a highlight piece when viewed from Lake Coeur d’Alene. This 100 year old cabin was restored as a guest house when the owners purchased the neighboring land and built a new cabin on Swede Bay. Restoration by Matt Fisher. 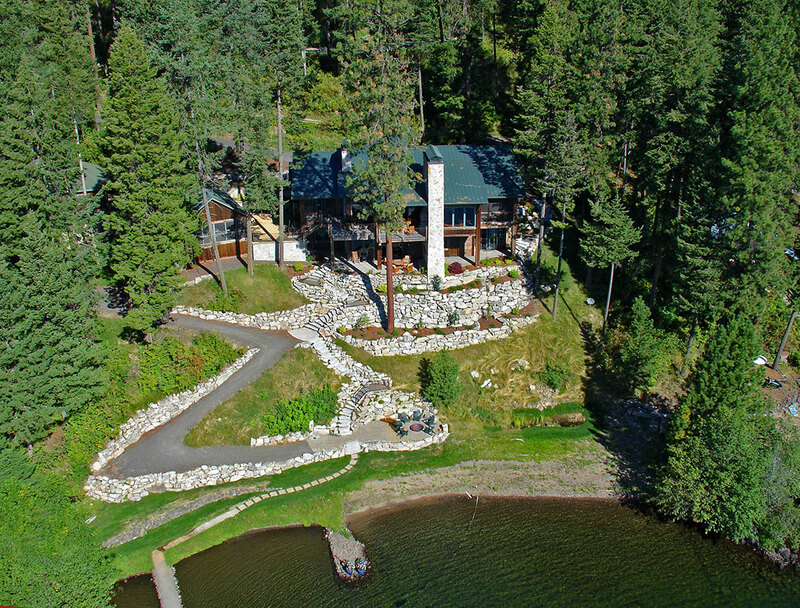 The artistic stone stairway winds through the landscaping to the lakeside fire pit, beach and boat dock, becoming part of the charm of this lake cabin. 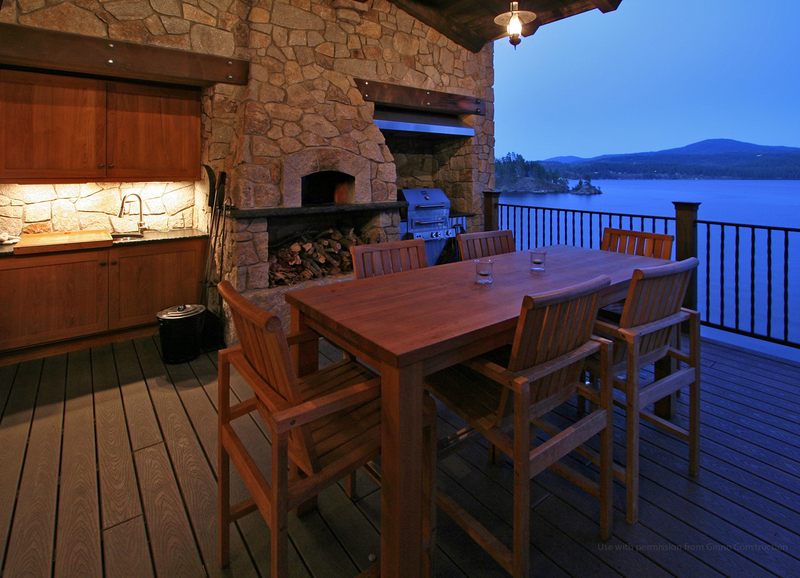 This wood-burning pizza oven from Italy is the centerpiece for this covered deck overlooking Lake Coeur d’Alene at Swede Bay. 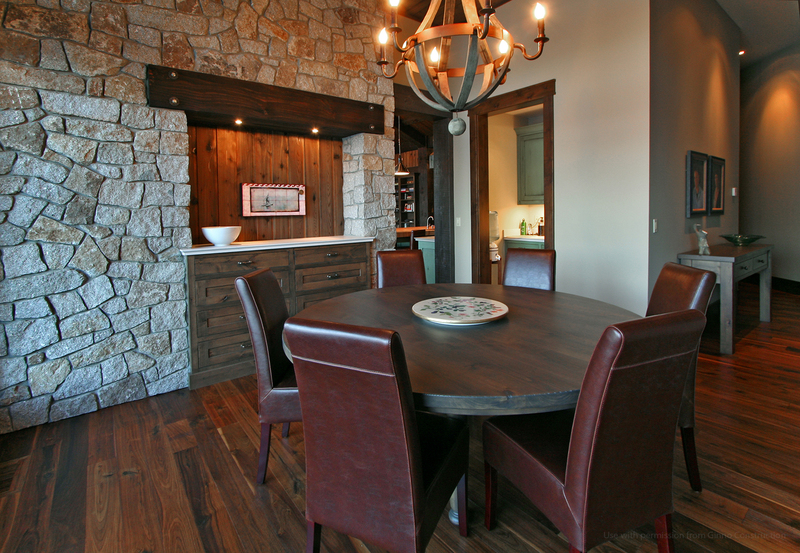 The rustic feel of the interior is brought outside with the stone and timber work. Custom home built by Matt Fisher. 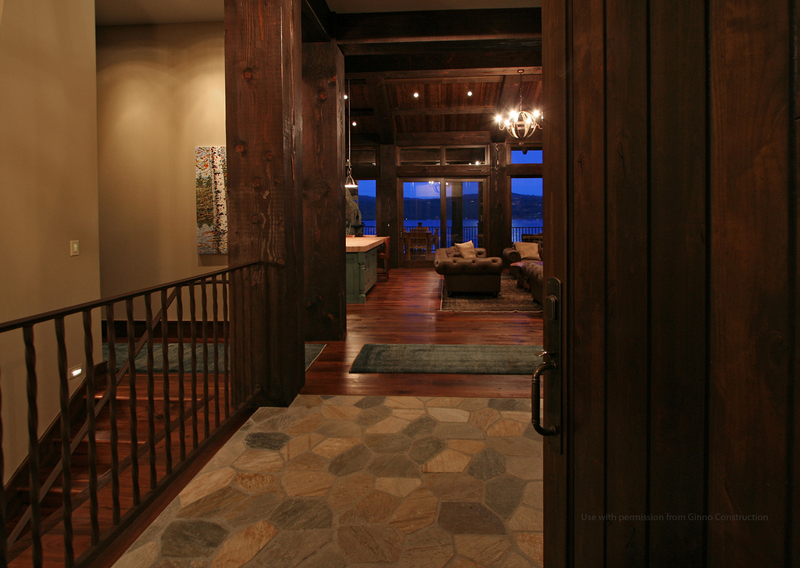 Upon first stepping into the foyer at this Swede Bay lake cabin, guests get a beautiful view of Lake Coeur d’Alene. This dining room on the opposite side of the outdoor wood-fire pizza oven, is tucked away behind the kitchen, offering it’s own splendid indoor view of Lake Coeur d’Alene for those chilly evenings. 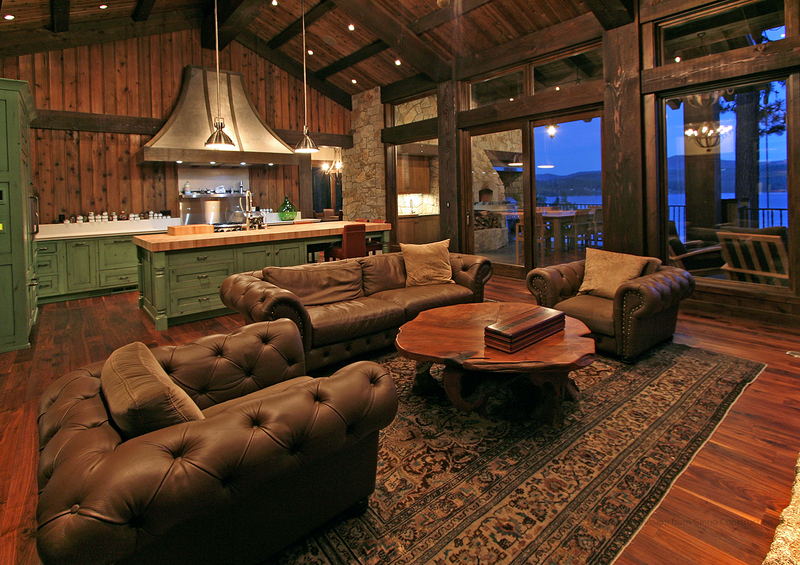 The rustic feel of this lake cabin continues in the basement with dark timbered framing and rustic wood floors with walk-out access to landscaped fire pit, beach and boat dock. Custom home built by Matt Fisher. The yoga studio created out of the old carriage house/shop is a hidden gem on this Swede Bay lot. 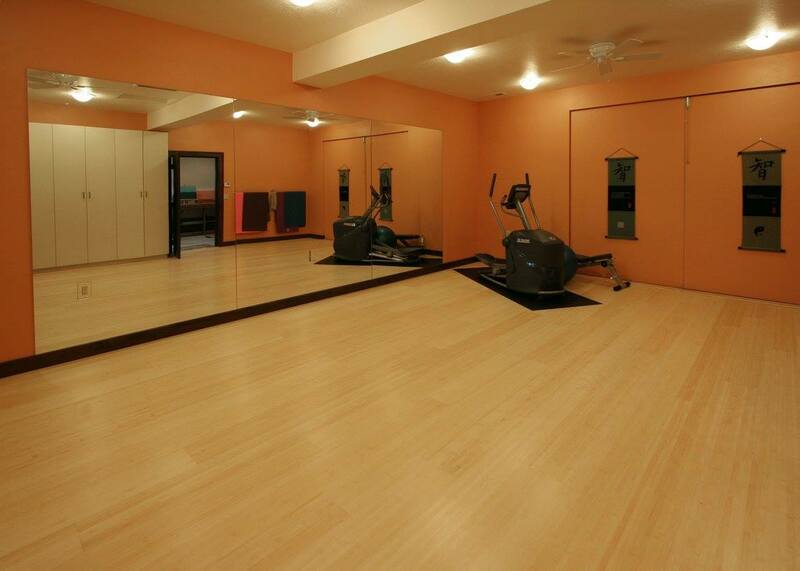 With hardwood floors, a wall of mirrors, and another wall of floor-to-ceiling cabinets, the studio can be used for any kind of exercise or dance. The side wall swings open to let the sun in and give access to the outdoors. 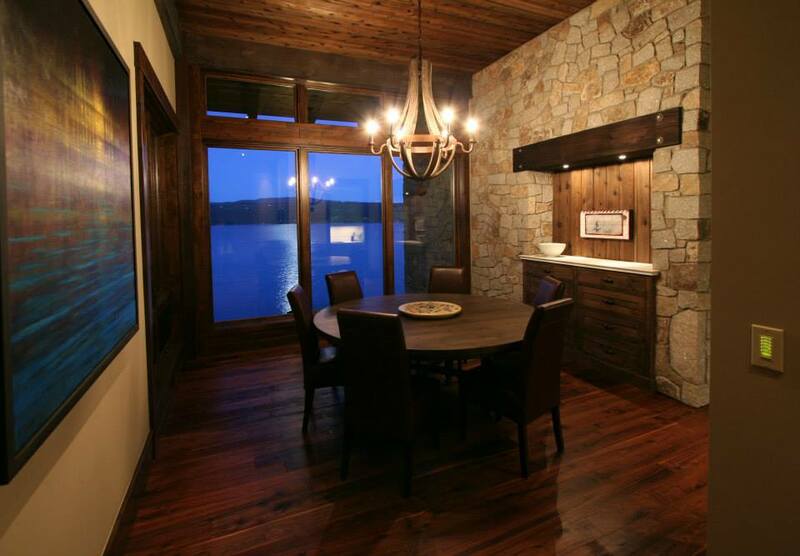 This 4400 sf cabin sits on a steeply sloped site just above Lake Coeur d’Alene. The site required stabilizing retaining wall and creative beach access while the 14′ wide stone chimney stands as part of the foundation and a visual centerpiece for viewers on the lake. 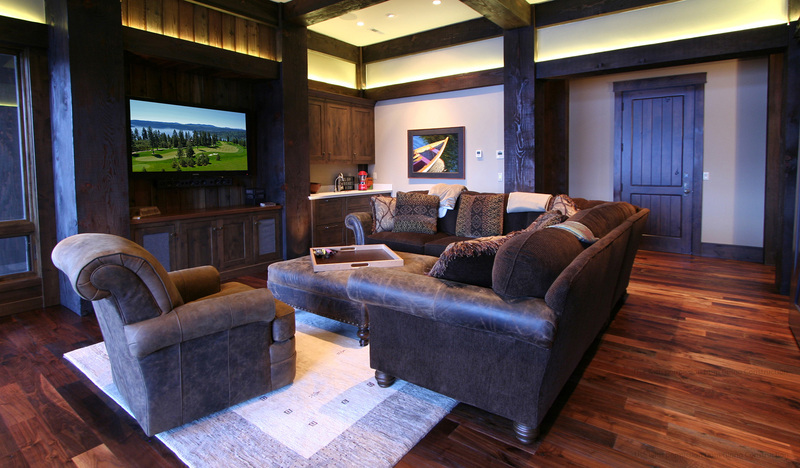 A custom home built by Matt Fisher.